We compare parking at 51 Heathrow Terminal 2 Airport car parks. Find the best Heathrow Terminal 2 parking deals from £17.31 per day or £45.31 per week. Terminals 1, 2, and 3 are all located quite centrally at Heathrow Airport. Terminal 2 can be accessed from Junction 4 of the M4, and Junction 15 of the M25. If you are using a SatNav, then you will need to use the post code: TW6 1EW. London Heathrow Terminal 2 - The Queen's Terminal re-opened in June 2014 and it is now home to nearly 30 airlines. With a huge investment resulting in brand new facilities, Terminal 2 is now a top class terminal. Heathrow Terminal 2 car parks scored an average of 3.7 out of 5 stars based on 5785 customer reviews. Remember, you can book in advance to save money on these. Heathrow Terminal 2's Official Business Parking starts from £26 a day and is only an eight minute coach journey away from the airport. This coach transfer runs every five minutes. This is a great option if you want a safe, secure car park that is not too far from the airport. A 10-12 minute transfer time from the airport, Heathrow's Official Long Stay Car Park for Terminal 2 is safe and secure and the transfers run every 10 minutes. This is a great option if you are away for several days or more. The official prices vary between peak times and how long you stay for, but if you book in advance you can usually get a pretty good deal, and you are not restricted to just the official car parks either, plenty of long stay car parks are Park Mark accredited and offer great discounts. Many people think Meet and Greet is hugely expensive, but it doesn't have to be. 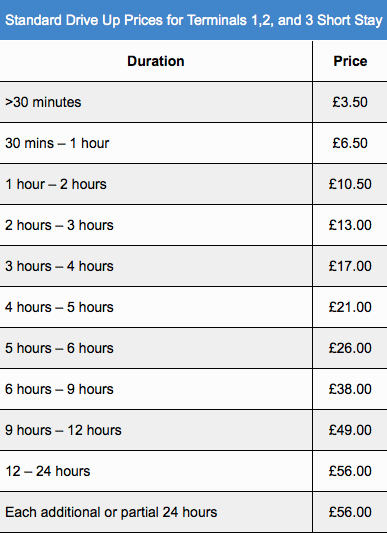 Many car park providers offer great rates, and it's a service that can save you a lot of time! You simply drive up to the dedicated drop off point - for the Official Meet and Greet service this is in the Short Stay Car Park - and leave your car with the staff! They will park it safely and it will be awaiting your return. No transfers, just efficient parking! Run a quote now to see all the different car parking options available at Heathrow Terminal 2.